Yay! It's finally Friday! I'm sooooooooo excited that the weekend will be here after just one more day of work. :) It's supposed to be a good one too, woo hoo! Bring on the sunshine! I have a couple of fun things to share today. First is that I'm the Guest Designer at the Get Sketchy Blog this week. I was really excited when Bree asked me to play along for the week. Check out their adorable sketch and see what the DT did. Here's my card. 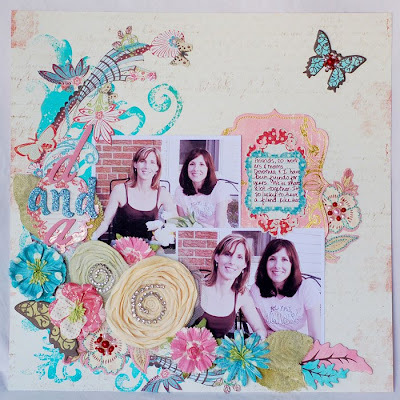 I used the gorgeous Life's Portrait line on it, my favorite Hambly frames and a couple of Prima flowers. The stamp is Melissa Frances. And yes, there's a doily on it. I've been using them a lot lately! This one also served as my page for The Color Room's 3rd color palette. I'm not usually fond of lilac and lime green together, but I like how it turned out! 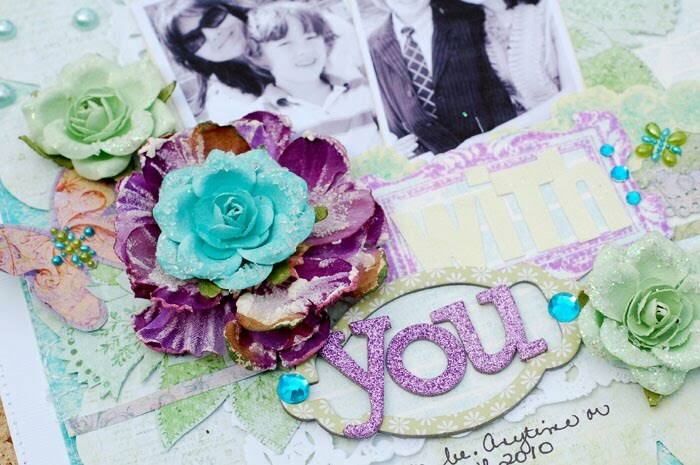 One more fun thing to share....I'm going to be working with the talented ladies at A Million Memories this month as Guest DT! Can't wait to dig into Michelle's kit. They are always filled with such fun goodies. I'll be posting my projects soon. Jules the blog princess - $50. Please send an e-mail to kimhughes22@aol.com and share your address. We appreciate you playing along with us so very much. Thanks so much for stopping by and reading my novel today! 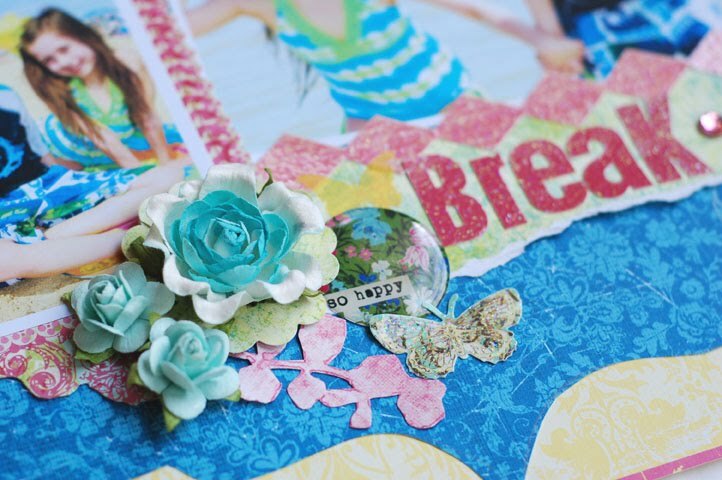 Have a great weekend and a Happy National Scrapbooking Day! I'm off today and am scrapping my little heart out. I love days like this! I am trying to catch up on everything, have a few assignments and would love to find time to clean and organize my room a bit. 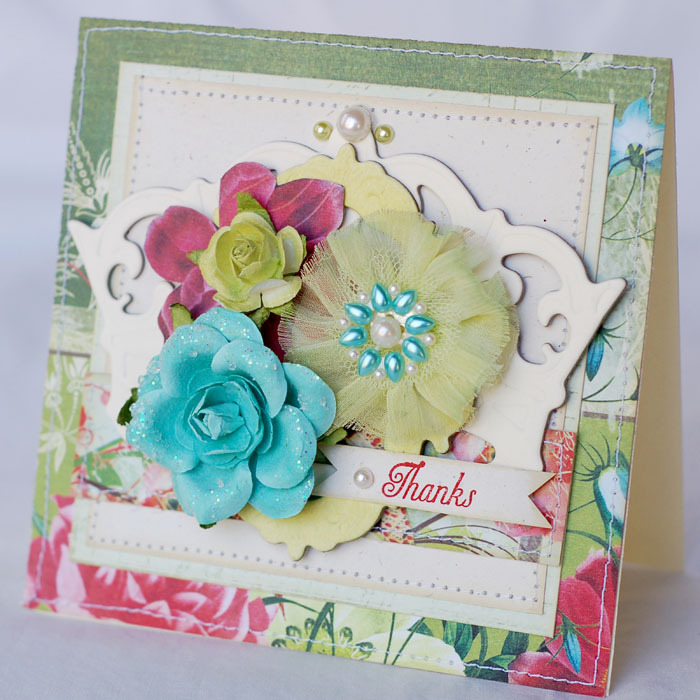 Just wanted to share my card for the Shabby Tea Room challenge #7. I love Debbie's inspiration pictures and this week's really speaks to me. Here's my card. I'm loving grey right now. I love how the Little Yellow Bicylce went with the Crafty Secrets image on here. And I love the color of this Prima rose. Just wanted to pop in and say hello. I've been working on a few things, but I can't post them at the moment. 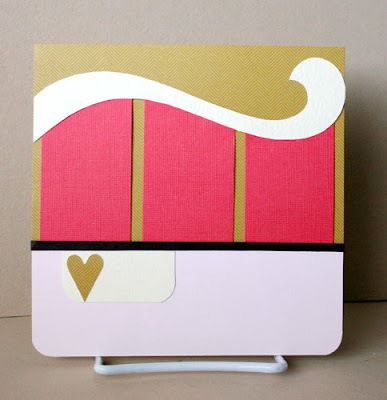 So, instead of letting my little blog sit here feeling unloved, I thought I'd post this one card. I did this one for Emma's. 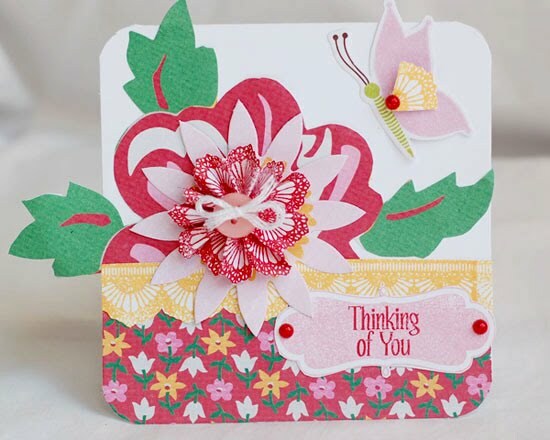 I used the Queen Bee line from Pink Paislee and a pretty little Prima flower. The gem swirls are Zva. That's it! Short and sweet today. Thanks for stopping by! 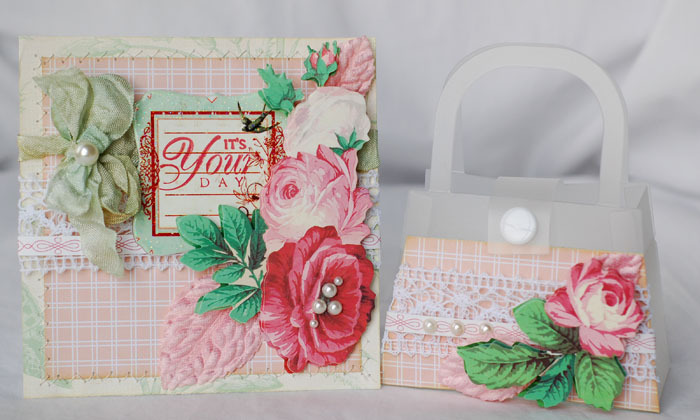 To view my Zva blog hop post and/or to link a card for the contest, click HERE. You have until next Tuesday to make a card with the sketch for a chance at the prize package! Thanks! This month Tattered Angels and Prima have paired up and what a pair they are! I had so much fun making these projects. This first card uses some TA chipboard pieces. 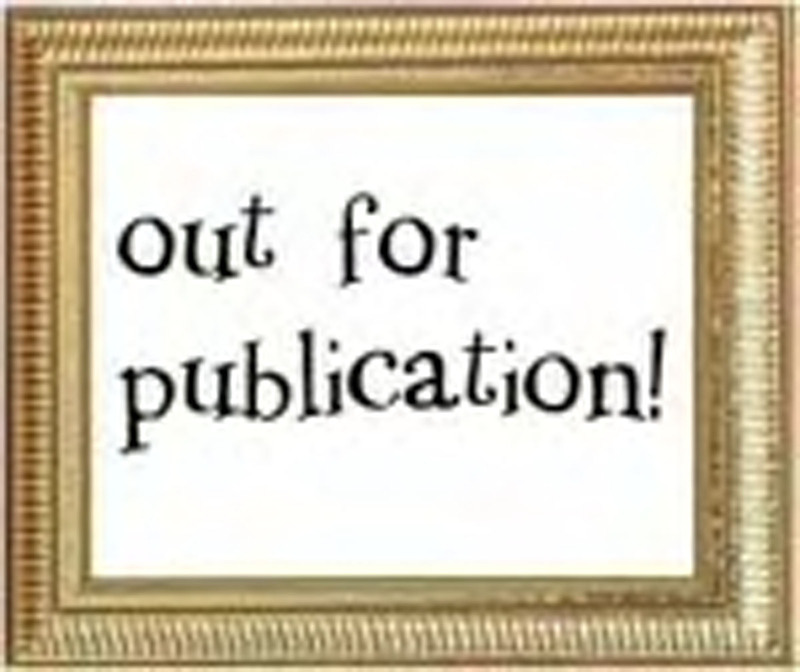 I left the crown as it was and sprayed the Frame Font frame Clover. I also sprayed the small flower and the tulle flower with Clover. 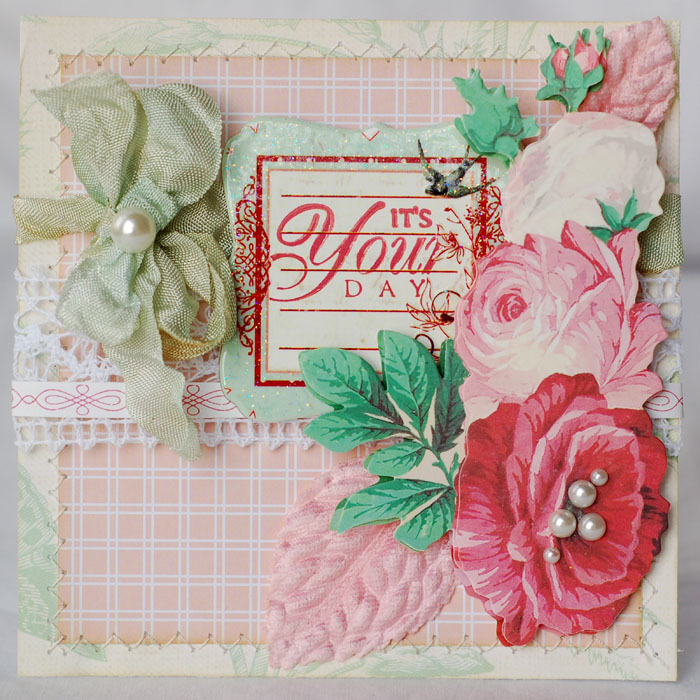 The papers are from the Strawberry Kisses line from Prima. I think this is my new favorite card! 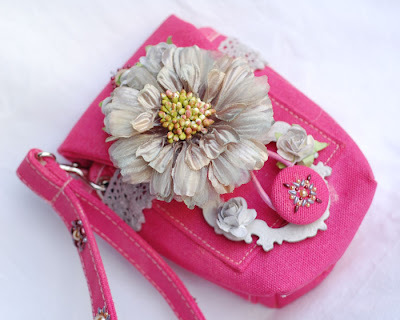 Next up is this cute camera case. It's from the Donna Downey canvas line. 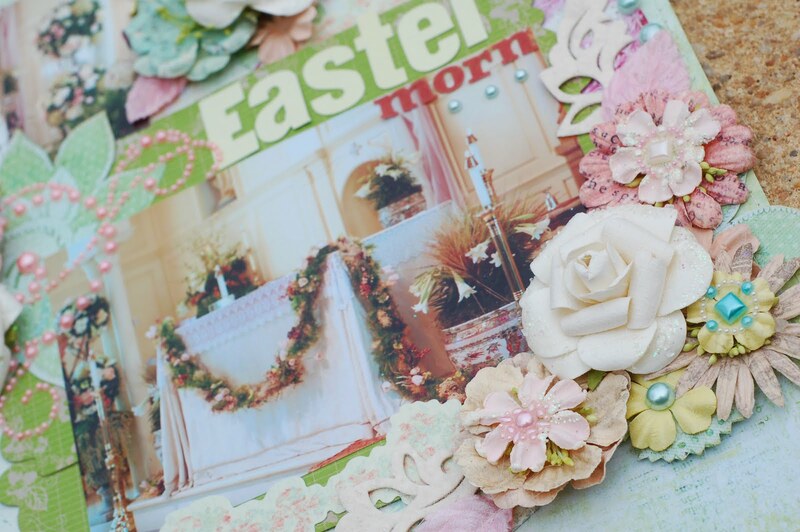 I sprayed it with Tutti Fruiti and added the flowers and chipboard. The smaller flowers and chipboard were sprayed with Silverspun Sugar. This was a lot of fun to make! I added some pearl Slip Centers, too. That's it for today! I'm so excited that it's almost Friday!!! To view my Zva blog hop post and/or to link a card for the contest, click HERE. Thanks! It's Tuesday! 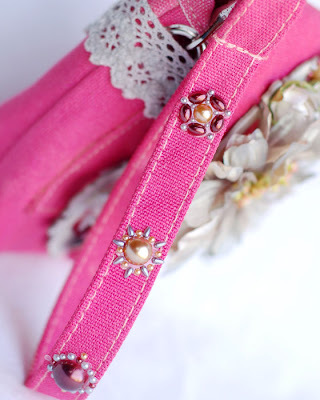 I've got quite a busy week this week, but just wanted to pop on and share a project with you. I did this one a couple of weeks ago, but hadn't gotten to share it, yet. I thought it would be a fun girly gift or could even be used for Mother's Day. 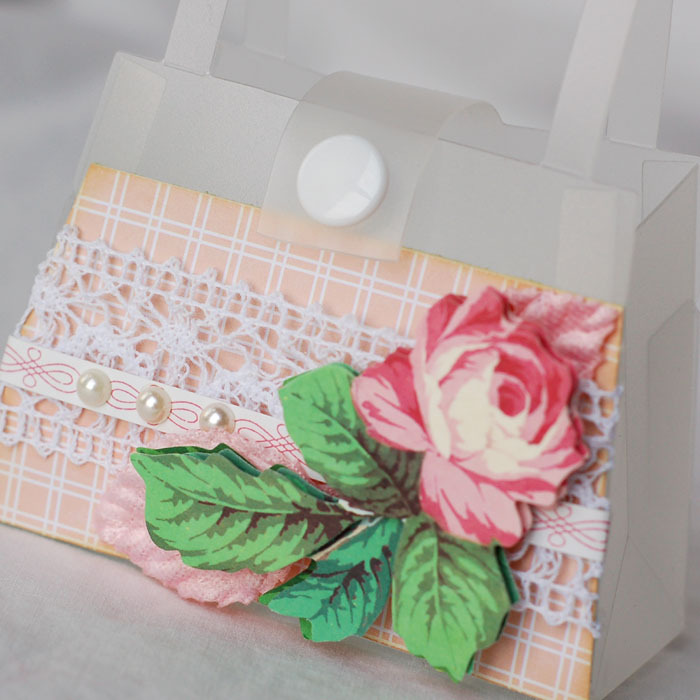 I used a cute clear purse from Emma's and added some American Craft's Botanique paper to it. The sticker is Anna Griffin as is the sticker tape. 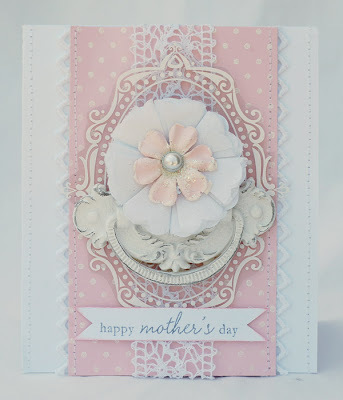 And, I added a Prima chipboard piece to the card along with this Melissa Frances stamp. Don't forget, you have until midnight on Thursday to make a card based of the sketch in my Zva post (see above) to be eligible for a prize package!!! Hope you all have had a wonderful weekend! Our's has gone quite quickly! Yesterday, we took a ride to a mall about an hour away so we could go to the Lego store. Ryan was in heaven!! And we ate at the Cheesecake Factory, so I was in heaven. It was a fun day. We even brought some cheesecake home. I have a Dulce de Leche Caramel slice sitting downstairs waiting for me. Just wanted to share this page with you today. These are pictures that I took during our day at the beach last week. How kids can splash around in 60 degree water is beyond me, but these two had a blast. We had such a great day! 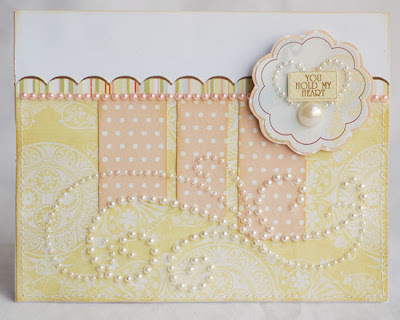 I used Little Yellow bicycle and GCD Studios paper on here. 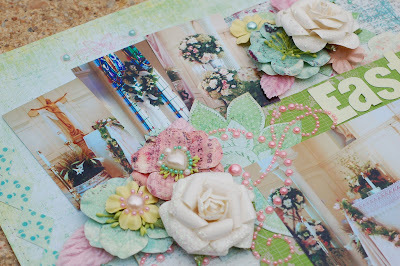 I also used lots of yummy Prima goodies included the flowers, stickers and elements cut from the papers. I love when there are girls in my photos because it gives me 'permission' to use lots of flowers on Ryan's pages. LOL. That's it for today. I rented True Blood on DVD and am watching the first season. I'm up to the ninth book in the series and decided it was time for me to watch the TV version. Loving it so far. Welcome to the Zva Creative blog hop. We are all sharing some projects using Zva products. I'm glad you're here to join in the fun. 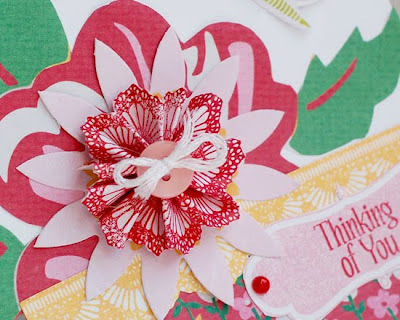 Each designer's blog will share a unique sketch that was created with paper...and there's a twist! It's a sketch that's designed with both scrapbooker's and card makers in mind. 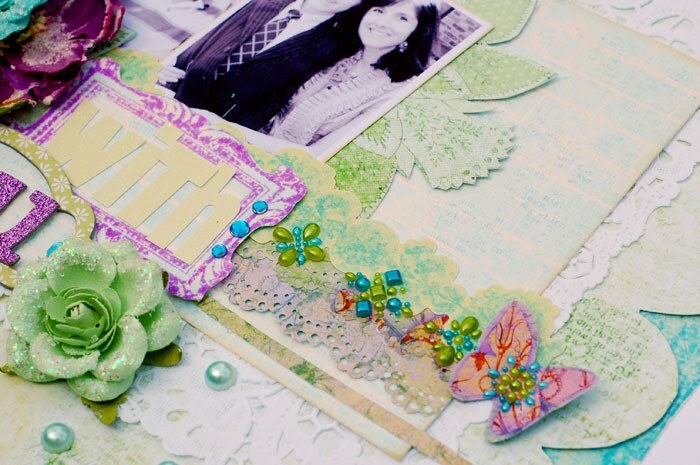 In addition to having the design laid out for you, each blog will have it's own color combo. The sketch can be turned and the color placement can be changed around. 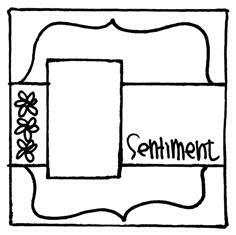 If you see a flower element on a sketch, please feel free to change it to something else if you like. Each sketch is a 6 x 6 page, but you can adapt the design to be horizontal, vertical or even a circle! The colors don't have to be exact, just stay within the color family that's provided (including using a lighter or darker shade). 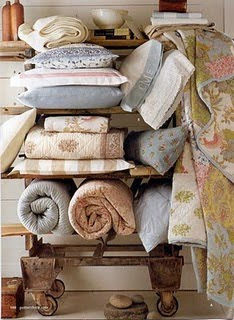 Adding neutrals like white, brown or black is ok...and "making it your own" is always fun to see! The Blog Hop begins at Kim Hughes' blog. She is linking to one of the Zva designers and that designer is linking to the next and so on. There are 12 design team members, so be prepared to be inspired along the way. 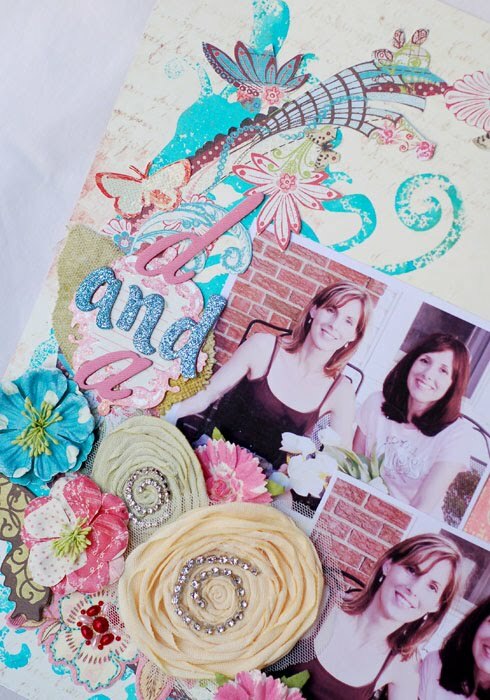 We would LOVE to see how YOU create with ZVA CREATIVE products! Please use this sketch to create any type of project (card, layout, home decor etc.) Your project must include Zva products to be in the running for one of the prizes. Add a link to your project in the comments section under this blog post. (A permalink is best. but if you don't have that option, please list the post date of your project). You will have until midnight, Thursday, April 29th to play along. 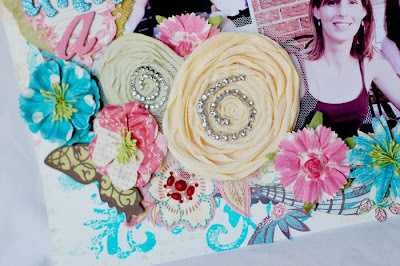 Hidden on 5 of the blogs is a wonderful Zva Creative prize package...Woohooo! Those blogs will be randomly chosen after the hop is over, so it's important to participate on as many blogs as you can (but you do not need to use all 13 sketches). The 5 winners will be announced on Friday, April 30th. We will do our best to notify each winner, but it's best if you can pop in to all of the blogs once again on Friday...plus, you never know what kind of inspirational projects that you may find.. I decided to flip the sketch upside down. 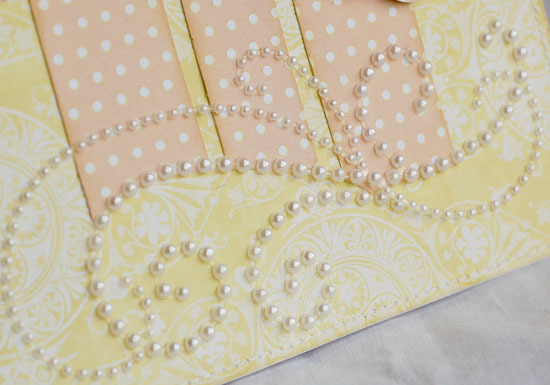 The papers and stickers are Webster's Pages and all of the lovely pearls are Zva. 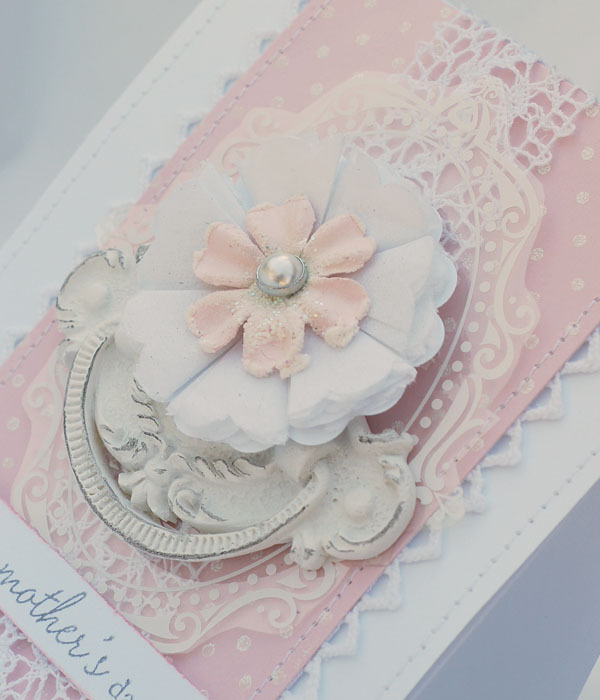 I used one of pearl swirls along the bottom of the card. 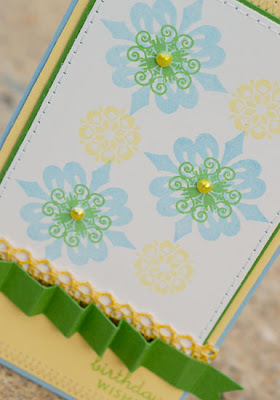 A small swirly part would have hung off the bottom of the card, so I snipped it off and adhered it to the other side. Bet you can't even tell where! I love being able to customize the swirls! 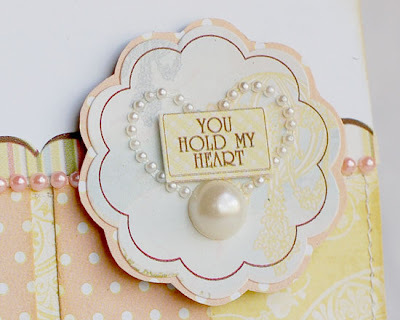 Also, I created my own heart shape by cutting off a piece of a pearl flower! So, that's it! I hope you can play along and create something with this fun sketch! 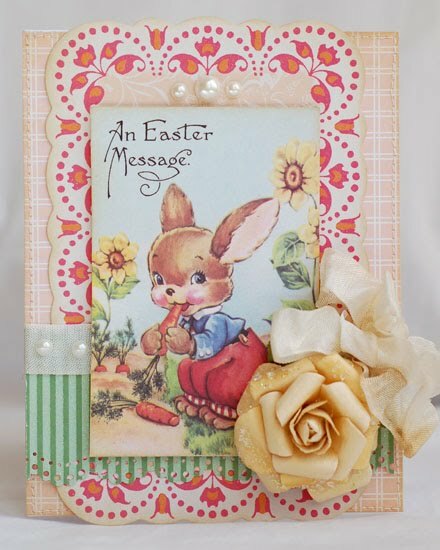 Please hop on over to the crazy-talented Jana Eubank next! Thanks for joining us and have a great day! Have you seen the new challenge site, The Color Room?? It just launched last week and OH MY, the inspiration is incredible. So many of my favorite scrappers all under one roof! 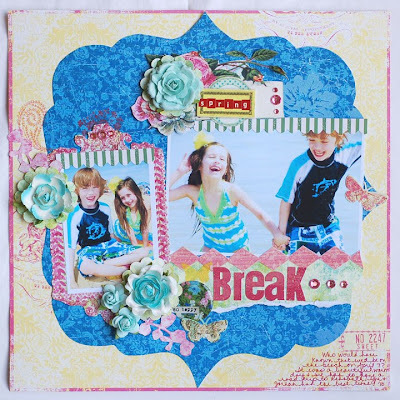 This week's challenge was to use pink, aqua and yellow. Here's my page. 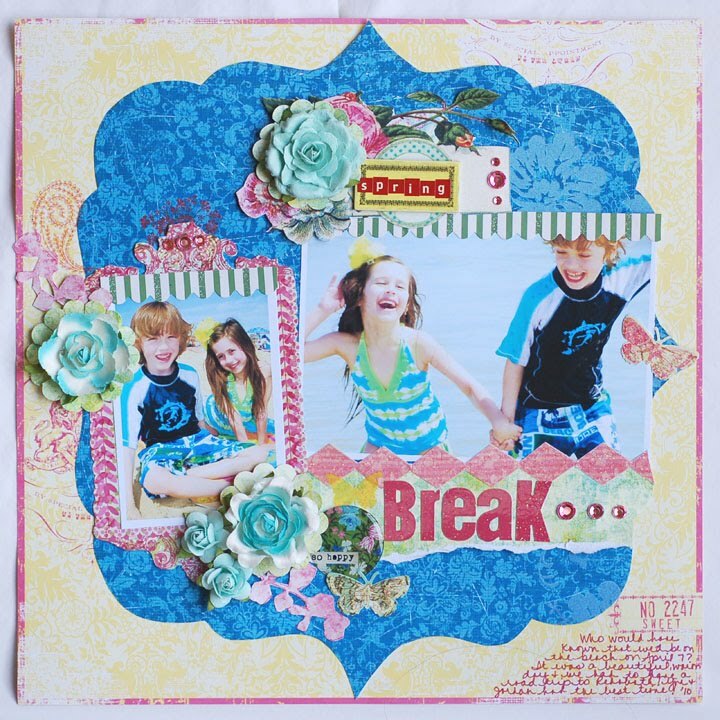 I had so much fun making this girly page of my friend Dorothea and me at the beach last week. This page is also posted on the Tattered Angels blog today. TA and Prima have paired up this month. What a match! 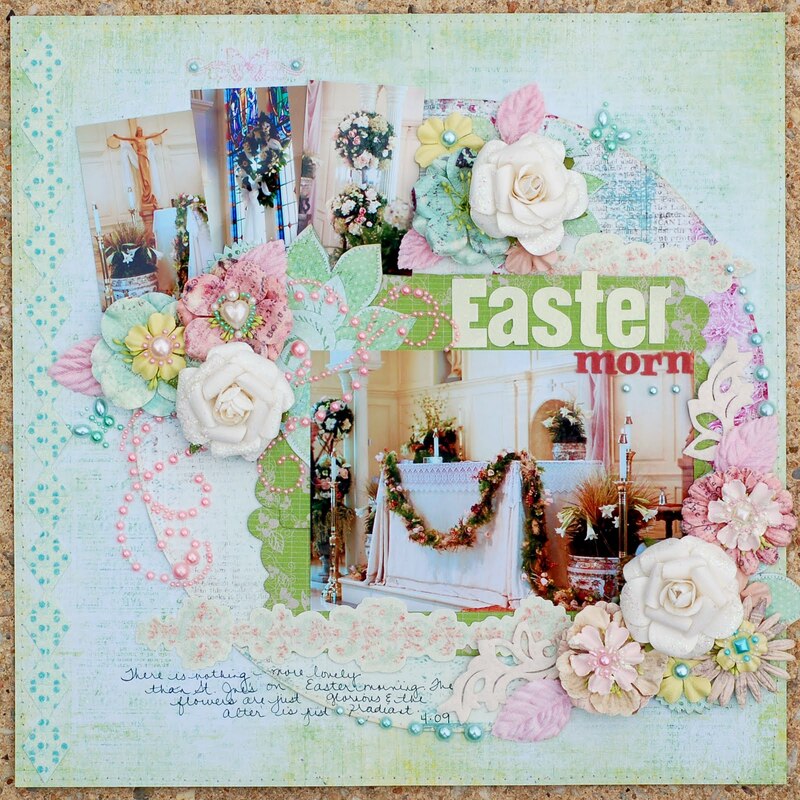 I misted some of the flowers, stamped with a large Glimmer Screen and added lots of misted Glimmer Chips. 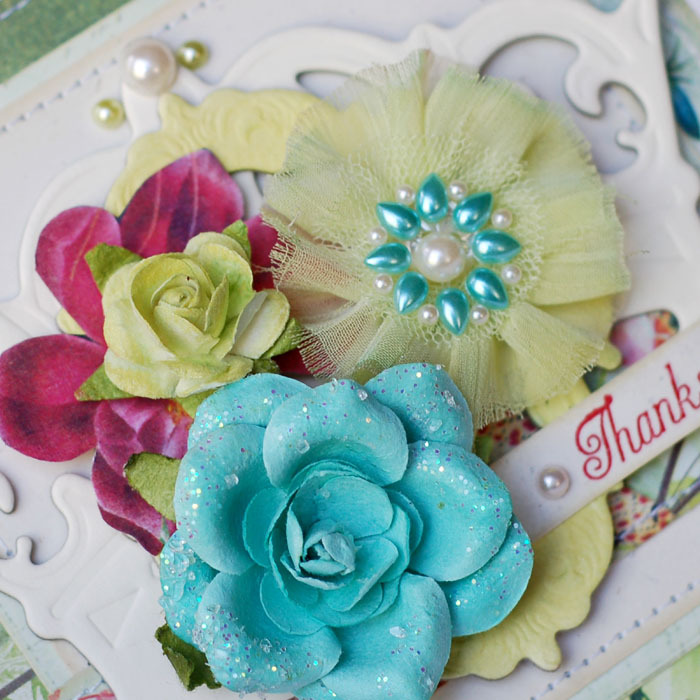 Plus, I was able to use lots of yummy Prima flowers! Be sure to stop by again tomorrow. 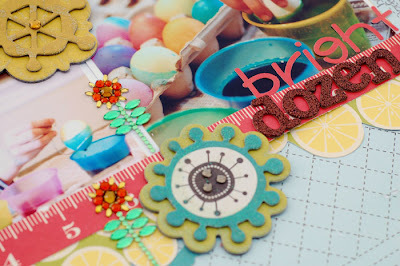 We are having another Zva Blog hop and there will be prizes! I just received my May/June Paper Crafts issue yesterday and wanted to share a fun project I did. 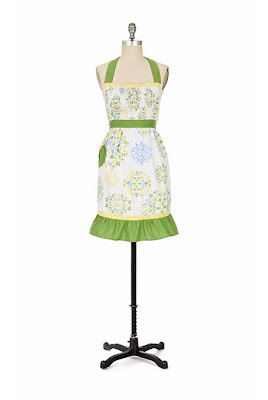 I used this adorable apron from Anthropology as my inspiration. I love the colors and the fun design. As soon as I saw it, I thought of Papertrey's Giga Guidlines. So, I used that set and stamped with New Leaf, Spring Rain and Lemon Tart inks. The sentiment is stamped with Mega Mixed Messages. To create the ruffle along the bottom, I fan-folded a piece of New Leaf cardstock. I used Scor-tape to hold it in place. To tie things all together, I colored the trim and pearls with a Copic marker. 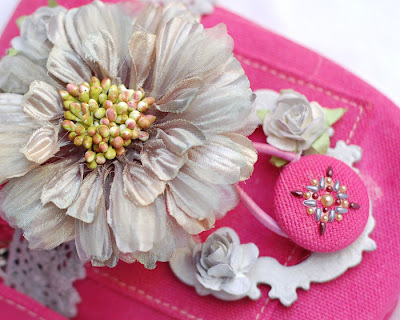 I love using them to make my embellishments match. Where Has My Vacation Gone? Anyway, I have a couple of things to share with you today. 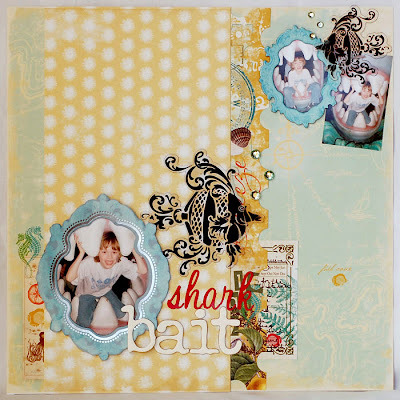 This first layout highlights photos that crack me up. We went camping at the aquarium not too long ago and Ryan loved hanging out on this shark. 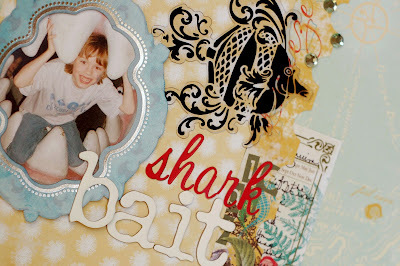 I used Webster's new Seaside Serenade line along with Tattered Angels' frames, fish Glimmer Glass and chipboard letters. There are a couple of exciting things I wanted to tell you about. First is that they are offering a gorgeous new limited edition color. 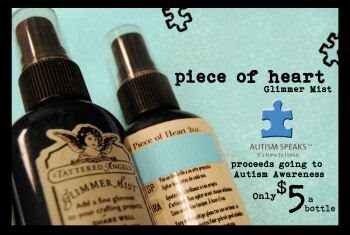 The sales will benefit Autism Speaks. Click HERE to find out more about it. 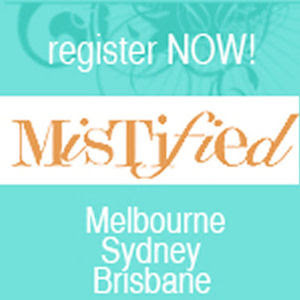 Also, registration is now going on for Mistified, day long, technique filled workshops that are being held in Australia!!! Do you know how badly I'd love to go to these?? Click HERE for more info. My final project for today uses some fun Technique Tuesday stamps. I paired them with some Jenni Bowlin Homespun papers. 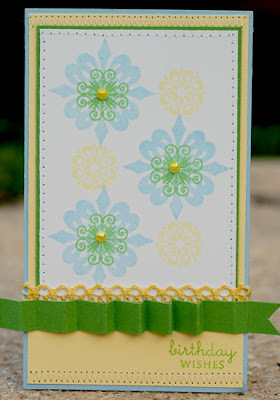 I used the Borderlines - Vintage Lace stamps to create the border and the flower on here. 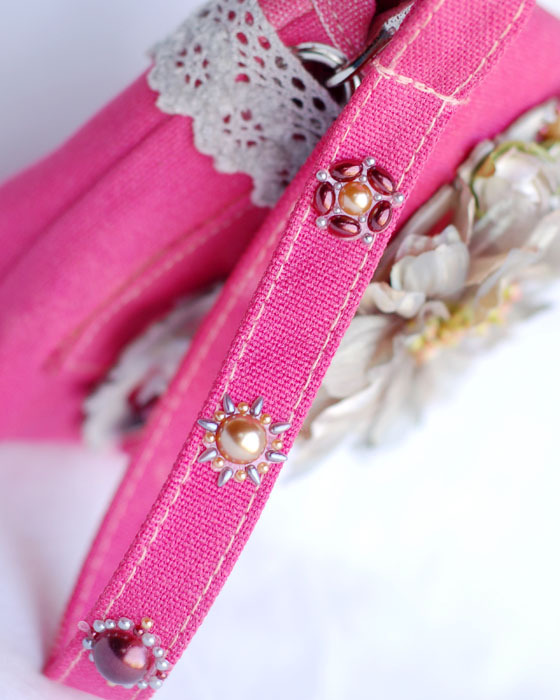 To make the flower, I cut the lace out and fan folded it. Then I adhered the ends and added the button center. 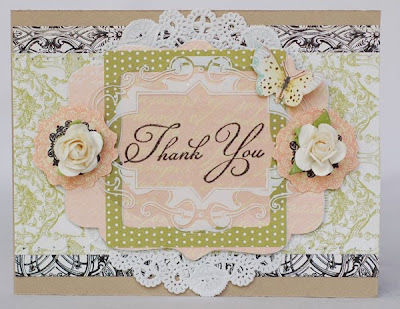 I finished the card off with a sentiment stamped with the Simply Stated set. Isn't that frame fun? Well, that's it for today. Off to enjoy my last day of 'rest'!! I just got back from the most amazing day at the beach! I decided on the spur of the moment to head down and it was heavenly - just like being there in the middle of summer. We got pizza at Grottos, ice cream, played arcade games and basked in the sun. Ryan even went in the water, though it was FRIGID..... Ahhhh, can't wait until summmer. I had the chance to play along with the Shabby Tea Room's challenge this week, Embrace the white. We had to use white and one other soft color. Here's the card I came up with. I used Papertrey's Polka Dot Basics and Blooming Button Bits stamps. I stamped and embossed the polka dots onto Sweet Blush cardstock and stamped the sentiment with Smokey Shadow ink. 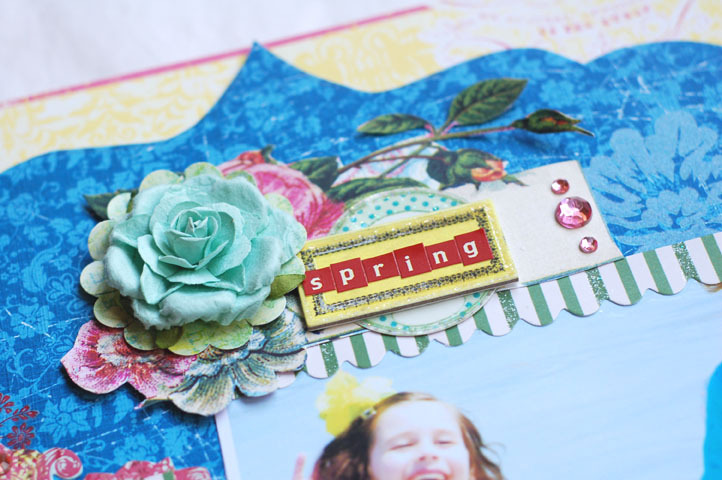 I added Melissa Frances resin, a Hambly transparency, May Arts and Maya Road trim and a prima flower. 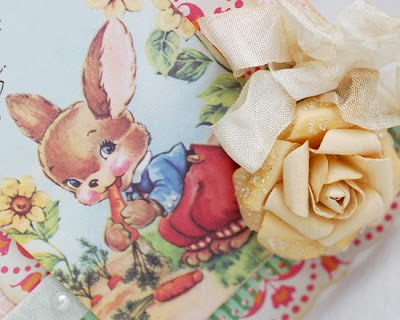 The tissue paper flower was made using a tutorial that Betsy Veldman did not too long ago. It looks so soft and pretty close up. I have a hard time photographing anything white, and even with photo shop, there's still more grey in the photo than I like. So, that's it for today. Thanks for stopping by. Have a great day! 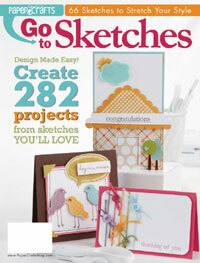 Anyway, as you know, Paper Crafts is celebrating the release of Go To Sketches this week. Anyway, here is my take. 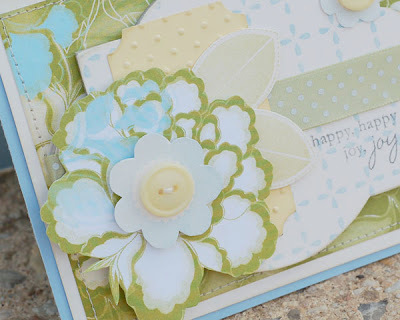 I pulled the colors from the gorgeous Studio Calico paper. I've been waiting to use this sheet and thought this would be the perfect card for it. Spring Rain, Spring Moss, Lemon Tart and Vintage Cream just scream spring to me. I used Papertrey Ink's Blooming Button Bits, and Background Basics Tin Types. 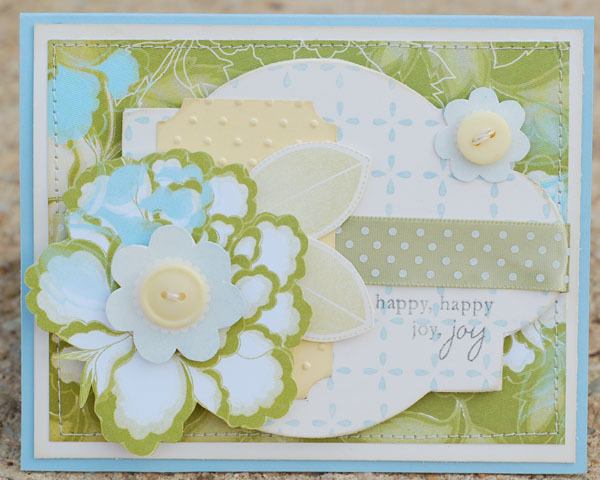 I stamped with Spring Rain and Smoky Shadow inks and used some Lemon Tart buttons along with some Spring Moss satin dot ribbon. The yellow panel was cut with the Fillable Frames #1 die. And be sure to check out the rest of the Go To Gals and their friends for even more inspiration!!! That's it! 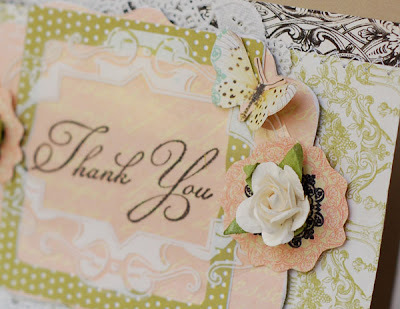 Have fun on the Blog Hop and thanks for stopping by! I'm posting this a day early since things are going to be really hectic around here today and tomorrow! I have everyone coming for dinner tomorrow afternoon and have to get it all ready today. ;) As I mentioned in the previous post, tomorrow is my birthday, so I plan on eating and having fun - not doing a whole lot of work. So prep ahead of time is going to be the key! I have this layout to share with you. My absolute favorite day of the year at church is Easter morning. The church is beautiful to begin with, but on Easter it is filled with flowers. I've never seen decorations so beautiful! Each year is something new and it's just breathtaking. Truly, the pictures don't even do it justice. I used all Prima on here. And I used the March Build A Page sketch. 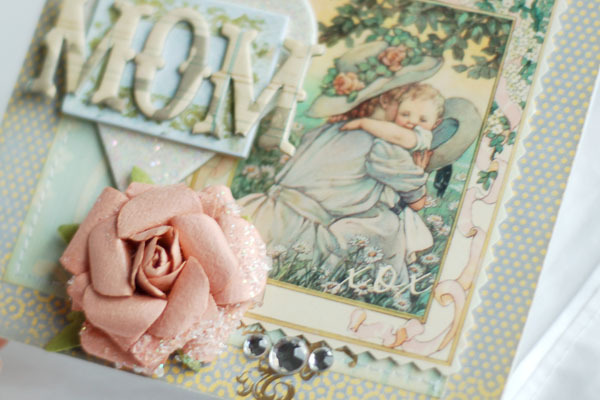 I really wanted to focus on the soft pastels in the pictures. So, to all of my friends who celebrate, hope you have a Blessed Easter! It's April!! Woo Hoo!! April is my favorite month, and that's no April Fools joke. Why? My birthday is the 4th and the best gift I ever got was born on the 9th. ;) As you can imagine, my birthday has now been eclipsed. LOL. But, that's ok. His birthday is a big deal around here. We made cupcakes for school today and we're going to have lunch with him as he hands them out. (They do the cupcake thing in the lunchroom. )We have to do it today since Spring Break starts tomorrow and his actual birthday is next Friday. So, technically, he'll be having a week long celebration. Can't believe Easter is right around the corner. Here's a card I did for Emma's this week. Isn't that image the cutest thing ever??? It's Crafty Secrets. 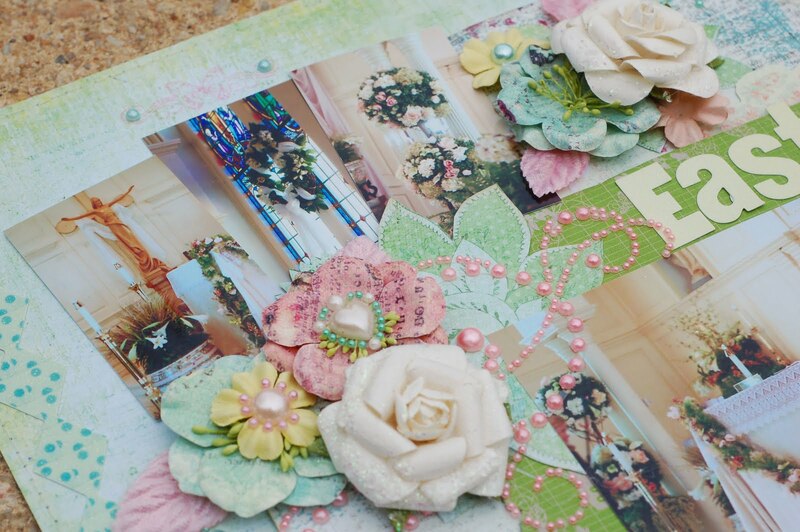 I used some American Crafts paper, a Creative Imaginations journaling die cut, Prima flower and Zva pearls. Finally, I leave you with a photo of my new baby. She arrived yesterday and has already churned out 32 cupcakes and a one pound turkey meatloaf. I'm in LOVE! 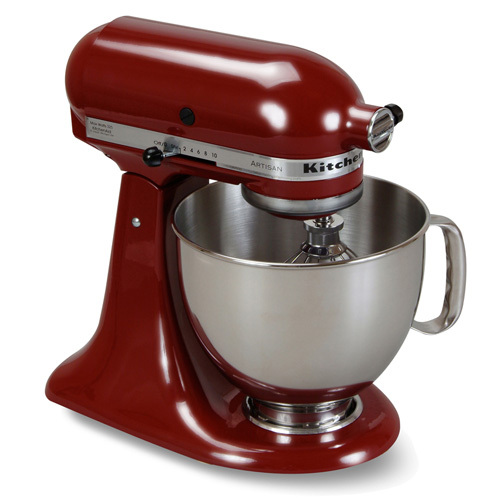 She's a Gloss Cinnamon Artisan Kitchenaid and she's my birthday present from my mom!! I'm so excited.